Every doctor or a volunteer has his own story… And every such story feels like sharing. 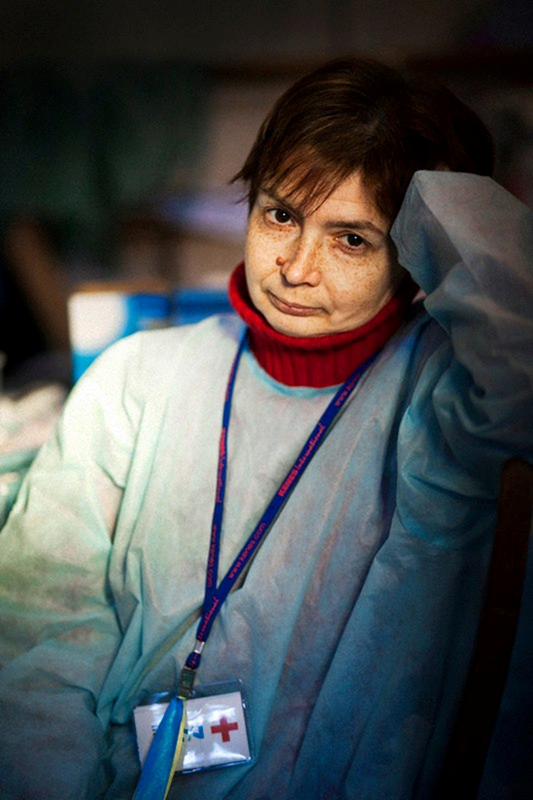 Here’s Viktoria, 51 years old, a neurologist from Kyiv. She works at a private clinic and in her spare time works as a volunteer at the medical center in October Palace. She has been working at Maidan since 2 December 2013. She was one of the co-organizers of the medical service. 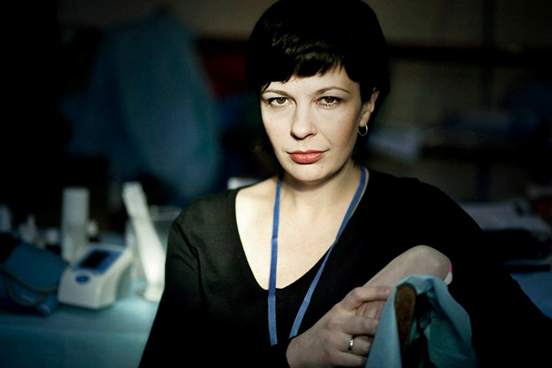 She recently participated in the resuscitation of a person who was brought in after a heart attack from Maidan. Only 15-20 minutes before that, donated resuscitation equipment was delivered to the medical center. Only thanks to this was the person was saved. And this is Dima. He is 35 years old, a traumatologist. He was “asked” to take a vacation by his employer. Thanks to the Chief Doctor (and Dima appreciates this) this was a temporary vacation and not a dismissal, although the Ministry’s instruction was precisely about his dismissal. 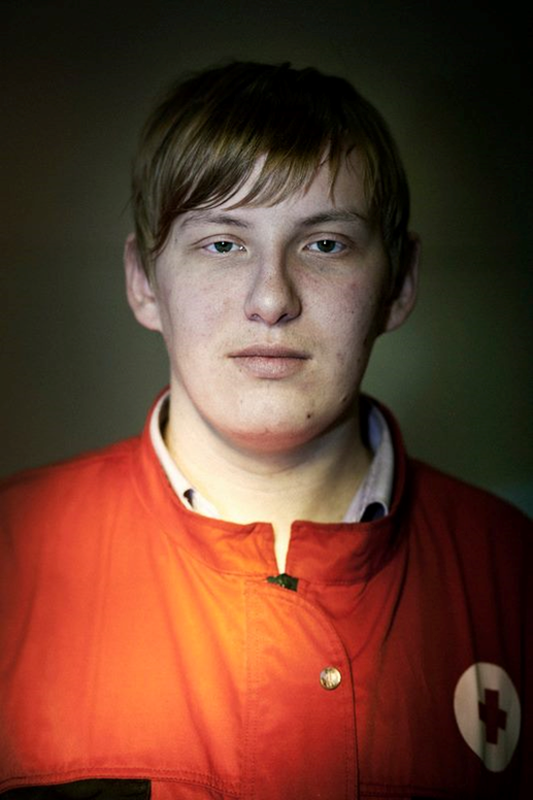 Dima’s motivation to start working as a volunteer at the medical center was Berkut’s violence against students. He’s been involved there since 3 December 2013. 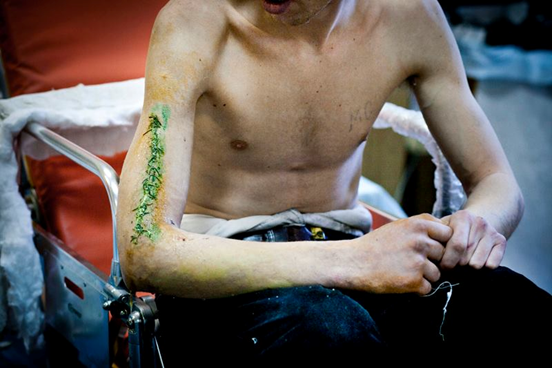 Dima was working at Hrushevskiy Street during the nastiest moments. However, the most memorable story to him was when it was necessary to urgently treat the strained voice of the singer Ruslana, who was having a public speech. 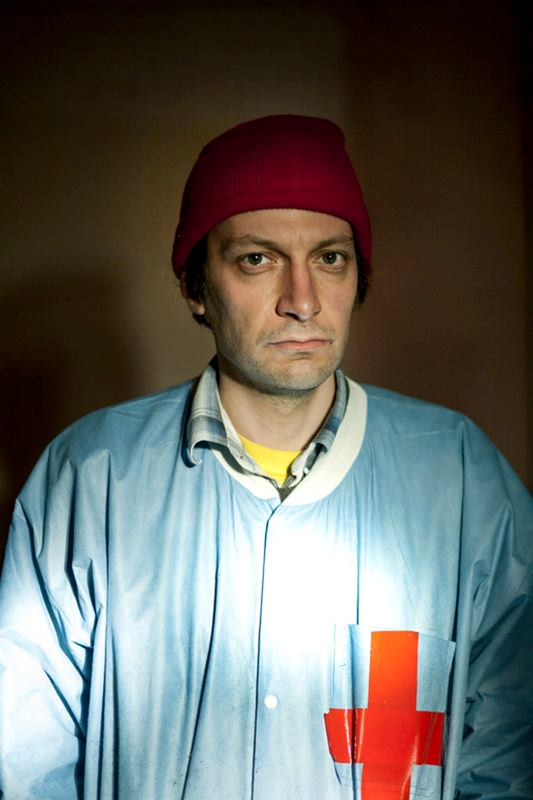 Even if he has to return to his day job, Dima is willing to work nights and in his spare time at the medical center. This lady with a charming glance is Hanna, a psychologist from Kyiv. She has been working at Maidan’s psychological support service from the beginning of December in her spare time free of private practice. She listens for hours to people from Maidan, because she is deeply concerned with daily violations of their rights. The number of people seeking psychological assistance increases daily: people with personal problems and with psychological overstress, which is typical for Maidan. Hanna keeps to a strict patient confidentiality code. The results of her work are the most important thing to her. People have started recognizing her, smiling to her and thanking her. And, as the need arises, people seek further assistance. 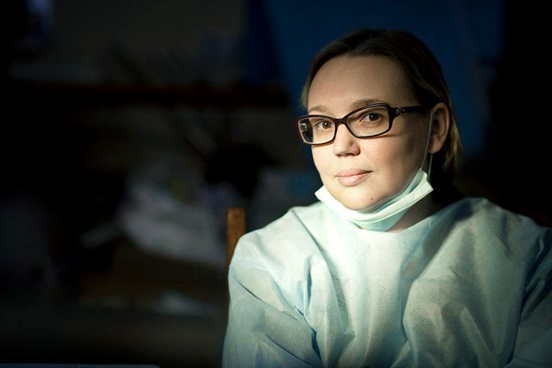 Another Hanna, also from Kyiv, a cardiologist, a psychologist and a psychotherapist. She got involved at medical center recently. Before that she kept bringing medicines for a long time, spending almost all of her money on this. Previously, she actively participated through Facebook, but later realized she wanted to “lend a hand” and that she needed to become a volunteer doctor. She is currently on maternity leave and when there is someone to babysit for her she spends her spare time at the October Palace medical center. 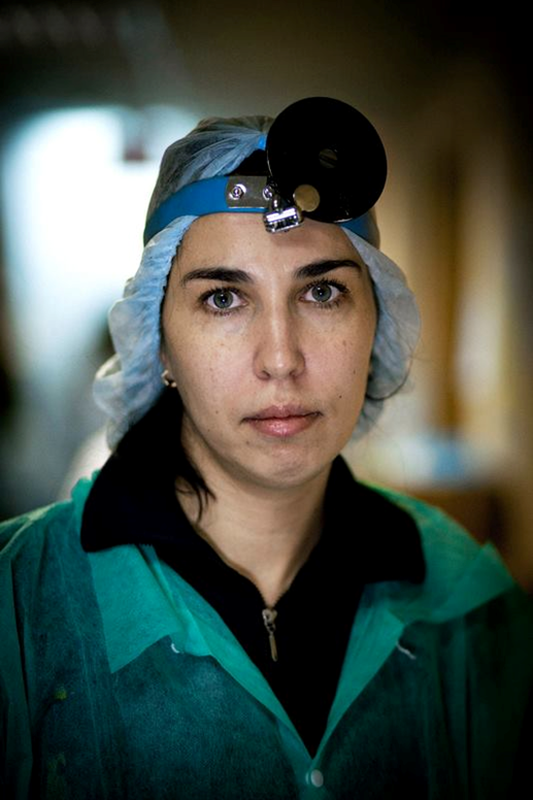 She feels she is needed here not only as a doctor, but to some extent also as a mother. Thus, she can provide care and treatment, but also listen to her patients. Serhiy, a k a Natan (according to Jewish tradition). Before the shooting, he looked at his watch and asked us to give him several minutes to pray. Serhiy was born in Kyiv. He isa therapist-neuropathologist. Before Maidan began he was dismissed together with other doctors at one of Kyiv polyclinics, which was closed down immediately thereafter. He was at Maidan at 2004. 10 years later he felt he could not accept quietly the violence against the students. He feels that children are one of the greatest values to everybody, and it was the violence against them that united the people. Within a week Serhiy started working behind the main stage at the tent camp, which consisted of just a few tents back then. The number of patients was increasing constantly together with the number of bronchitis and viral infections. 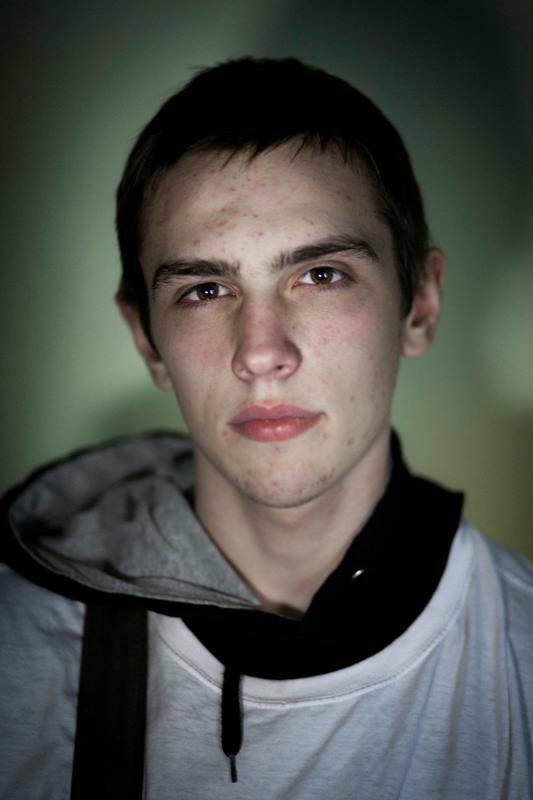 Moreover, for several days Serhiy gained experience the hard way as a military medic. During the attack on 10 December 2013 many of the injured found themselves in the first-aid post with head wounds caused by police batons, especially concussions. Those who were standing in the first rows keeping down Berkut’s attacks suffered from chest compression. Serhiy saved the lives of many people that night. Particularly, he remembered a guy who nearly died. His blood pressure dropped and he fainted, but the Maidan doctors didn’t even have a blood pressure meter. The guy was resuscitated and he immediately ran away leaving behind a 100 hryvnias. Serhiy says that back then everone was greatly supported by the prayer that the Greek Catholic priests recited from the stage. Serhiy also prayed to regain balance and peace. This girl’s name is Julia. She’s an otolaryngologist. She receives her patients straight in the corridors of the third floor of the Trade Union Building. She came recently from Mariupol and can stay at Maidan only for a short time, as she had time left over from her summer vacation. According to her, she cannot not leave her job or her family, but she must make at least a small contribution to the life of Maidan. Julia did not even expect to have so many patients here. There are people from the barricades, from the kitchen and her colleagues. Quinsy and viral infections are often the case. Julia was impressed by the sense of cohesion and equality with strangers. She will keep looking for opportunities to come here again if there is lack for doctors. However, she has great expectations that the life of the country will settle down by Spring and everybody will return home. Uliana’s story is just about the most touching. Uliana came from Lviv. She is completing her internship as a pediatric surgeon. 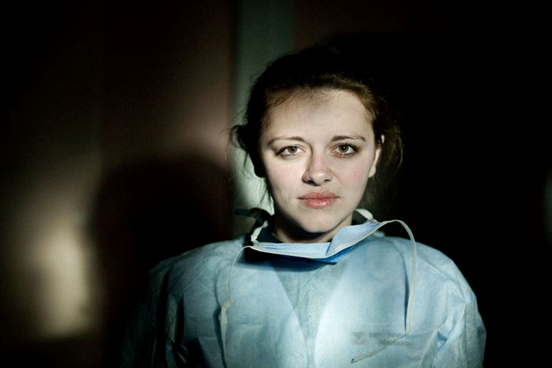 Doctors from western Ukraine come here using their time-off. To do this they need to work without days off. It was Uliana’s third visit to Maidan when the activitthe ies at Hrushevskiy Street began. She had to take a vacation, but the management supported her. She attempted to put her fear away, but instantly found herself in the middle of events. It was her night shift on the night of 22 January 2014. Towards morning young and older men were brought to the first-aid post with heavy wounds every 10 to 15 minutes. The most injured areas were the head, neck and chest. Every emergency team had a separate operating table. A guy was brought to the near-by table in a very bad condition. Many doctors gathered immediately to apply step-by-step resuscitation measures to the wounded. Finally, the adrenalin injections were next… Uliana filled in the syringe. But all the efforts were in vain – the guy died. It was Serhiy Nigoyan, Uliana was familiar with him from the time she worked with mobile teams. She recollects that he had asked for aid once with a finger cut and was behaving very joyfully. After he died a priest came to perform a funeral service for him. And when the priest finished his prayers he burst into tears. The priest later explained he had a son who died at the same age on this very day several years ago. 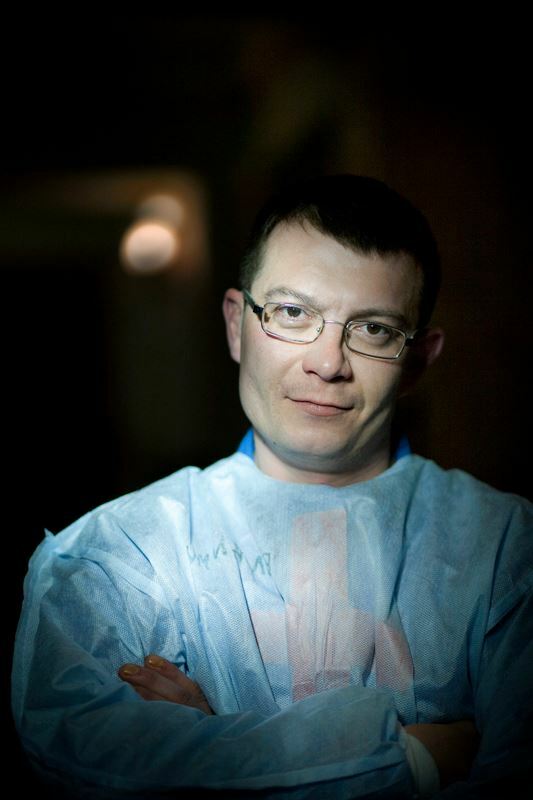 Olexandr is an orthopedic & trauma surgeon from Lviv. He has become the chief medical officer at the self-launched first-aid post at 1 Hrushevskiy Street, though he didn’t even think that it would happen. Olexandr has always been an apolitical person, but when his friends suggested that he register for Maidan’s medical reserve, he did so without a moment’s hesitation. When he got at Maidan, he felt an incredible euphoria. Despite being in a senior position, he went to the barricades on the hottest days along with his medical team. In order to be here instead of working in Lviv, Olexandr has been taking more and more days off. However he is extremely happy that he’s got an opportunity to work here, among best doctors from all over Ukraine. He says that the health center at 1 Hrushevskiy St. is provided with everything necessary by 200%, and that all of it is due to charitable people who immediately respond to the unit’s needs. “If municipal hospitals were as fixed up!” he throws up his hands. Olexandr works in the health center all day long, and at nights he is in charge on the frontline and roadblocks. They are called “rangers” – groups of 4-6 people who work on the frontline. Before the first military assault, the “rangers” went around the whole territory with walkie-talkies and checked up on the troops. But after January 19 it became a separate unit for operating under combat conditions. Doctors become paramedics there. Their main task is to deliver the wounded to the health center. He remembers: “Just after I came I right away had to revive 7-8 people who had had epileptic seizures.” It was his first time there, and even though Olexandr is a traumatologist, he had seen such seizures only several times before. There was no time for thinking and fear, he had to rescue people within hours. Since then he has seen and experienced all kinds of stories: starting with the funny story about a young man who accidentally threw firecrackers into his pants, and finishing with severe wounds. He says, that still people are coming with wounds made by plastic bullets or splinters… these are guys who dare not visit doctors for a long time or those who just didn’t want to leave their posts because of the fear that doctors would take them from Maidan. Olexandr remembers a guy who didn’t sleep for 4 and a half days. That guy was sure he had to be at Maidan and didn’t need any rest. “About 5% of the people here become obsessed,” he says. Doctors try to talk to them, ask them to take a rest, visit a psychologist. Denis is quite a young guy, he studies at the medical lyceum, and plans to study surgery in the future. He was at Maidan on 30 November himself, and had to rescue a person who felt bad for the first time ever. Together with friends they brought that person to the Main Post Office and gave first aid while waiting for the Red Cross. Since that incident Denis decided not only to participate in meetings but also would register for mobile volunteer teams. Now he’s combining this job with his studies. He visits Maidan almost every day, and when there were occasions on Hrushevskiy Street when he worked for several days helping victims without any rest or even going home. Denis’s team was among the first that began helping people injured because of gas, batons and slugs on Hrushevskiy St. He personally pulled out 4 of the 15 mm plastic bullets. It happened right in the street, as the health centers weren’t equipped enough at the time, and many people had to be sent to hospitals. But after the militia began arresting victims right in the hospitals, guys started operating on injured people locally (in two health centers at Hrushevskiy St.). Denis tells that on 22 January he saw 2 dead bodies which just disappeared. In other words they weren’t registered at Maidan, weren’t filled into card-files. It had happened when Berkut started a military assault and volunteers couldn’t reach the bodies. He thinks that the bodies were taken by the militia and now it will be impossible to identify them. He says that both had severe gunshot wounds in the chest. He remembers how he pulled out a plastic bullet for the first time. That wounded man was lucky as the bullet entered just soft tissues but passed through a thick jumper, t-shirt and jacket. Next day that victim came to Denis to thank him. Denis says he’ll never forget this man. It was first case, his real trial by fire as surgeon. Denis is planning to continue volunteering. He thinks that unfortunately things will move not so peacefully, as people are engaged in actions, not just conversations. Those were just several stories of simple and great people who are doctors by profession. But in fact, there are many more of them. And all of them are heroes. Everyone has his own barricades at the moment. And the barricades the doctors face are some of the most challenging in this revolution. But they are being defended with dignity, selflessness and a strong belief in victory.